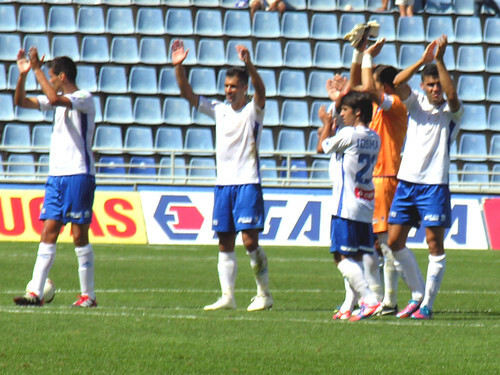 Another week, another win, and more new heroes as CD Tenerife beat second placed Real Aviles 1-0 in Santa Cruz. Jesus Alvaro came in to cover for the suspended Llorente at left back and had a cracking game including setting up the winning goal. Sergio Aragoneses is always steady and reliable in goal but excelled himself this week with a brilliant penalty save. This was proper opposition, Real Aviles sat second in the table just behind CDT and looked a useful side when they refrained from rolling around like victims of an invisible sniper. Sergio had to be alert in the 9th minute to make a one handed save from a Aviles attack. Alvaro looked a little unsure at first but with Tarantino putting in another towering performance at the heart of the defence he grew in confidence especially after shielding the ball from Abraham near the corner flag and forcing the forward to give away a goal kick. Loro saw a good chance deflect high and over the visitors goal but just before half time Alvaro attacked down the left, beat three defenders, and squared the ball for Aridane to add to his impressive tally. Suso could have increased the lead before the whistle but snatched at a near post shot. The industrious Suso had another half chance at the start of the second half when the ball fell just short of his control and the keeper was able to claim it. As the rain began to pelt down Tarantino got booked for a hand ball in the box but Sergio pulled off a spectacular full length dive to save the penalty. Bruno nearly got his first goal of the season with a header that looped over the bar, Chechu replaced Cristo, Yeray came on for Alvaro, and Nico took over from Suso. Aridane made a good break and threaded a pass to Nico he was only able to poke the ball wide at full stretch. Oh the things I do for the Armada Sur, a bit of consumer testing was on the cards as I headed bright and early to Santa Cruz with Barnet Dave. We were eager, hammering on the door of the brewery at 10 am to sample the new tour. I was a bit peeved that there were only seven of us visitors, parties were announced as being up to 15 people but after wrestling with the on line registration I booked the last two places, our guide said they had cut the size down to make it more manageable. Never mind, the smell of hops was in our noses and our multi lingual guide and his young female assistant took us past check in and across the courtyard. Bottles and barrels were piled high in the store area and I was twitching with anticipation. Luckily they hadn’t noticed my five litre flask and siphon straw sticking out of my bag. Wearing our high visibilty yellow jackets we watched a video in the reception room and paid our three euros fee. Entering the cooking area the air was humid and sweet, like being wrapped in a warm beer blanket, the water, malt, hops and yeast were sloshing away in a huge vat and I thought I could see someone swirling round in there with a huge grin. 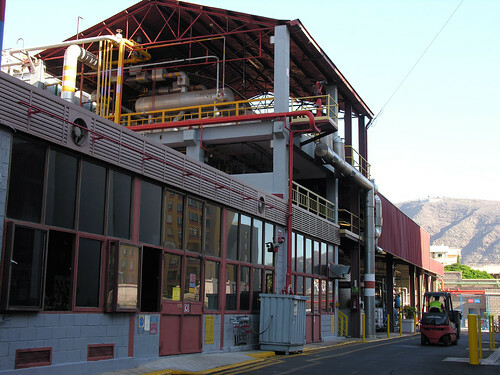 Our guide gave us background and history in Spanish and English before we moved on to the packaging area. 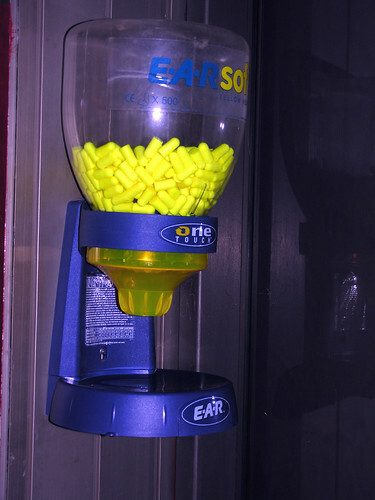 Were those yellow bubble gum machines all around the brewery, maybe not, they gave out ear plugs and we were glad of them in the bottling plant. There were armies of Dorada Pilsen bottles marching along the conveyor belts, I deployed my fishing rod but couldn’t find any Especial to snare. 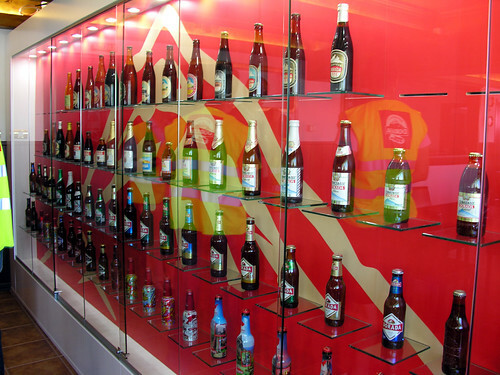 The last stop was the museum and bar, one whole wall was a glass cabinet containing bottles from the start of Dorada production in 1948. I imagine that is what Los Abrigos Andy’s living room looks like. 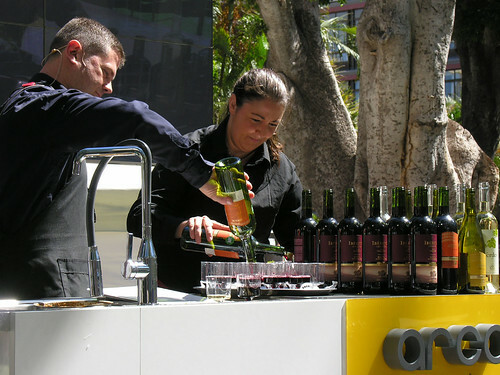 Our guide started to pour us glasses from the Dorada tap and we sipped as we chatted. 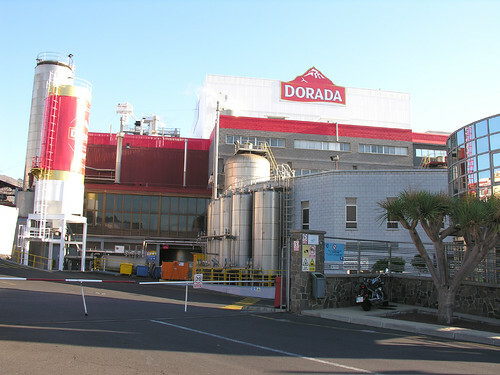 The brewery, part of SAB Miller, also brews Tropical and Carlsberg (under licence) but it seems that Dorada is the dominant sale in Gran Canaria despite our view of Tropical as a Pio beer – cue memories of 2,000 CD Tenerife fans singing at Las Palmas ground “ No No No Tropical”. Especial on tap was a rare sight and we managed to coax some of that into our glasses and we were also offered some less filtered Dorada that was more bitter and yeasty, very good too. Dave was tempted to buy a t-shirt but they didn’t go up to experienced beer drinker sizes. 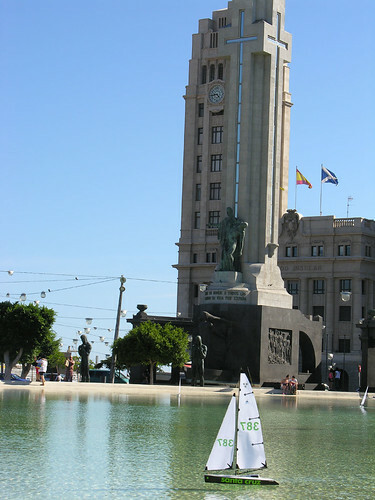 After a 90 minute tour it was tram time down into the capital and leaving Dave to explore I headed to the port to check out the ships and then on to Parque Maritimo for the second part of my mission. The swimming pool complex to the side of the Auditorium has recently done a deal to give CDT season ticket holders free entry (normally 2.50) so I had to check it out. 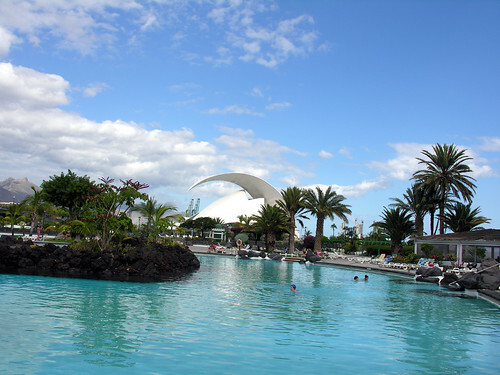 It was midweek with a mix of cloud and sun but half of the complex with the largest pool was closed off and only a scattering of people were around the other kids pool and a still luxuriously big second pool. I had to show my N.I.E number as my CDT season ticket is in the name of the peña Armada Sur rather than mine but once in I was soon doing circuits in the main loop of the sea water pool. Out of the pool like a wrinkly blond prune I had a good look around, it’s a lovely complex with shaded areas, showers and a Pizzeria Café and there’s also access to a small beach. 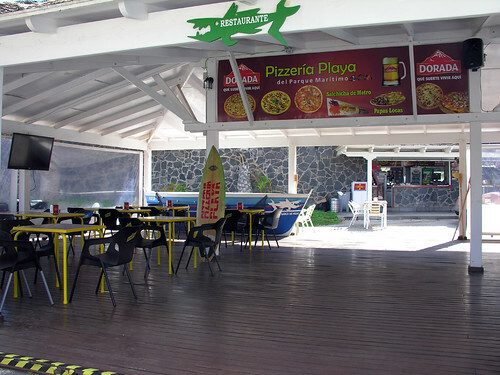 Outside the café there is a covered area with a large TV, part of the link up with CDT is to make this a fan zone, I’m sure it could prove popular for the local fans to watch away games as part of a relaxing Sunday. Well worth having a look – go on just dip your toe in the water. 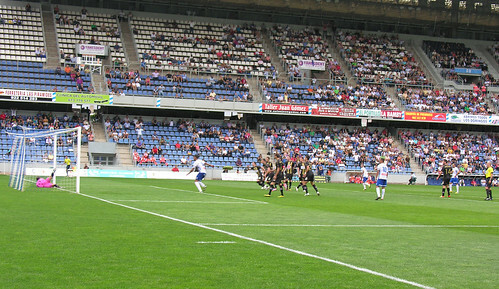 The whole squad needs to be up to scratch if CD Tenerife are to escape Segunda B so a midweek friendly against Ibarra at El Fraile was the perfect setting to look at some of our fringe players. Catching the bus over with Barnet Dave we made the short walk to the bar opposite the ground and met Kevin for a pre match Dorada. The first pleasant surprise was the 7 euro admission for the game, how different from CD Marino’s 15 euros for the Las Palmas friendly. Once inside it was clear we didn’t have that many players on duty, the training injury to Josmar will keep him out for 3 to 4 weeks but he still had his usual beaming smile as he sat on the terraces with German – not sure if he is also injured. There were around 300 people present as the action kicked off, Roberto started in goal, other notable faces were Sergio Rodriguez at right back, Abel, Bravo and Jeremy in midfield, and Guillem Marti as the main striker supported by Nico. 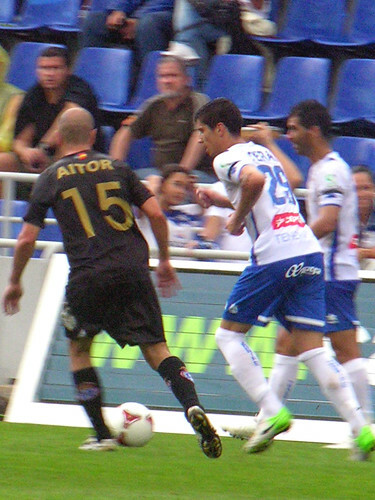 Ibarra are one of the better sides in the Preferente but Tenerife made them look poor, there was a good cohesion about our side. Jeremy set up Nico for the opening goal and Abel added a second with a strong strike from outside the box. Marti was very aggressive up front and looked keen to prove his worth, Jeremy looked strong and confident and a good play maker. As the second half kicked off there were no wholesale changes, a good idea to make sure players got a much needed full run out. Ayoze Perez and Ayoze Placeres were the major changes and later Angel Galvan took over in goal. 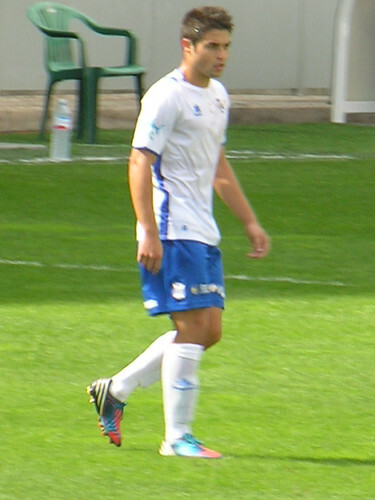 Junior scoring sensation Ayoze looked lively and went close to scoring several times. By now the sun had set and the floodlights were on, trouble is they only have two pylons on one side so players were difficult to spot in the dark, I’m sure at one point I spotted Lord Lucan and Shergar prowling the touchline. Nico made it 3-0 and Jeremy (above) capped an impressive display with the fourth. A good workout and nice to hear several players knocking loudly on the first team door. 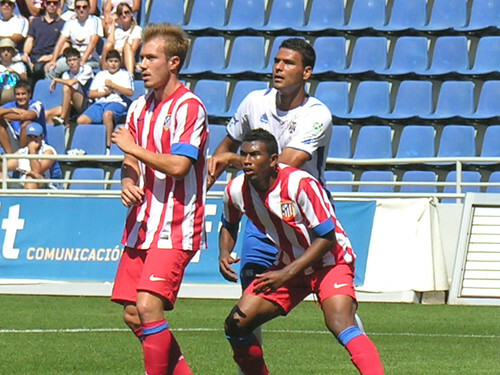 Not a weak link in sight, CD Tenerife turned on one of their finest squad performances as they swept Atletico Madrid B aside with a 4-0 pounding. While I am giving out plaudits, full marks to coach Alvaro Cervera for his tactics, The more experienced Tarantino was returned to the centre of defence and Suso was included in the starting 11 ahead of Chechu, the rewards were immediate. In their first attack Suso opened up Atletico and served the ball up to Luismi Loro for a first minute opener. Stunned fans barely had time to praise their heroes before Aridane got in on the act to bang in his seventh strike of the season. The stadium was buzzing, Madrid had arrived as a team in form and Oliver Torres was supposed to be the best thing since free Dorada but Tenerife made sure his admiring scouts (and any Girl Guides) had a wasted trip. Even in such irresistible form it would have been greedy to hope for more early goals but glory starved chicharreros never refuse another helping of classy football. Suso is like a fox in the chicken coop and as he worked his way into the box he was brought down and Loro gleefully converted the penalty, 3-0 and only 18 minutes on the clock. There were signs that Atletico could be a useful side but Tenerife squeezed them and kept their chances to a bare minimum, Medina again played the holding role to perfection and Cristo Martin was always ready to prompt another attack. This wasn’t just about pretty football, there was plenty of good old fashioned hard work and players supporting each other. Into the second half and Suso was relishing his running battle with defender Elbis, he won a corner that Loro just failed to convert. 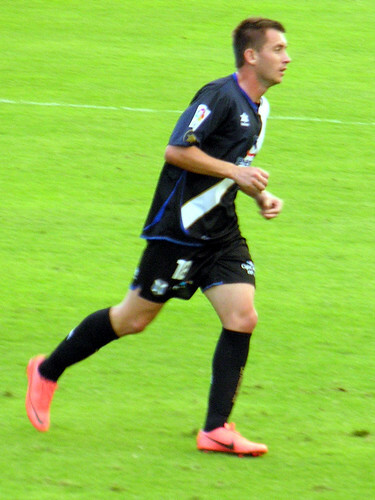 Cervera took the opportunity to give fringe players a run out, Josmar Zambrano got a big cheer when he came on for Loro and he was soon showing his cheeky skills running in from the left. Cristo Martin was fouled just outside the box and was unlucky to see his free kick go over the bar. 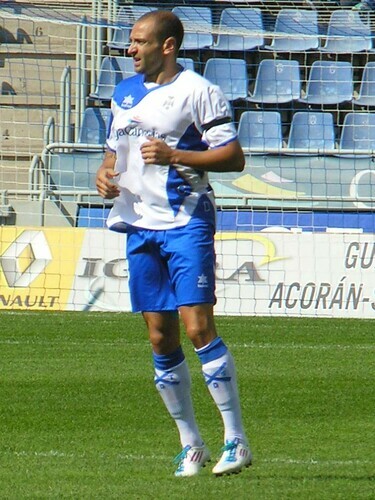 Abel came on for Medina and Guillem Marti for Aridane and the play continued to flow. Marti showed more hunger this week and he and Martin both went close to adding another goal. 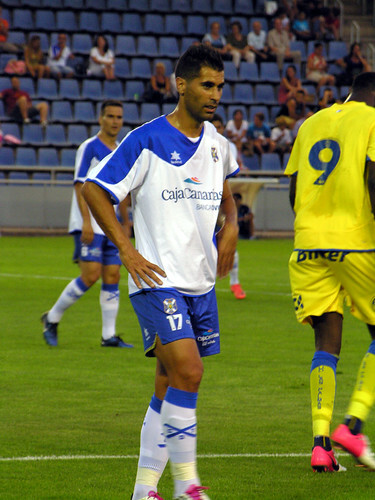 Marti had a strong run at goal in the final minute and was only stopped by a Saul foul, a second booking meant an early finish for the defender and as the ref pointed to the spot Marti placed the ball wide of the keeper to open his Tenerife goal account. It was nothing more than was deserved, the 8,471 crowd were lapping it up, this will send out a strong message to the other teams jostling for play off positions, Tenerife are determined to hold on to the leaders spot. Sailing majestically across the Plaza de España sails billowing and not a crew member in sight. Blimey they were a bit small though, was this an episode of Land Of The Giants? 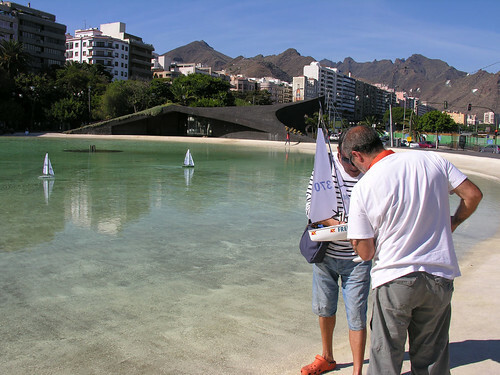 no just an exhibition of remote controlled boats as part of the Sal 2 promotion day in Santa Cruz. The models were a good start but even without an anorak and a flask of milky tea I have become a bit of a ship spotter and I’m always drawn to Santa Cruz harbour to see what the tide has brought in. Looking down from the roof of the Fred Olsen building the two cruise liners were old friends but two gleaming modern motor yachts on the near side caught my attention. 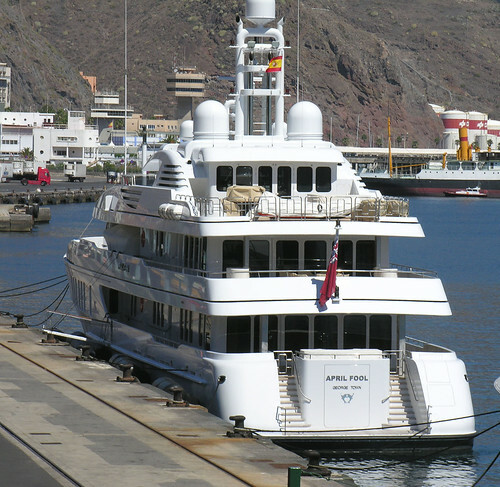 Down at mooring level I was able to admire the sleek lines of the Fortunate Sun and April Fool. 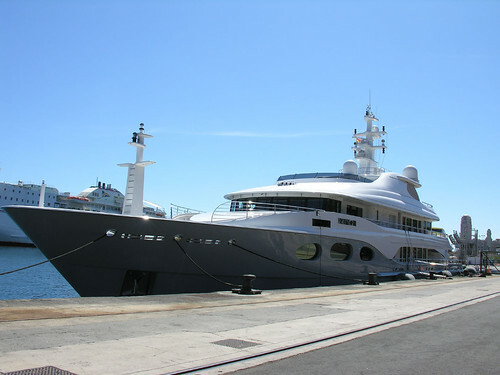 Later research valued them at a cool 54 million and 46 million euros, both can comfortable sleep 12 guests. I think I could get used to port hopping in such luxury but I’d probably need a paper round just to afford the polish for the chrome. Walking out to the marina I’d already spotted a military ship but it was beyond the public access so I had to zoom in from the main road to the auditorium to find out it was HMS Edinburgh. It was a lucky spot, the type 42 destroyer is on its last deployment before being sold off. Built in Birkenhead in 1983 time and budget cuts have caught up with the grand lady, it sailed out of Portsmouth in September last year and returns for the last time next spring. 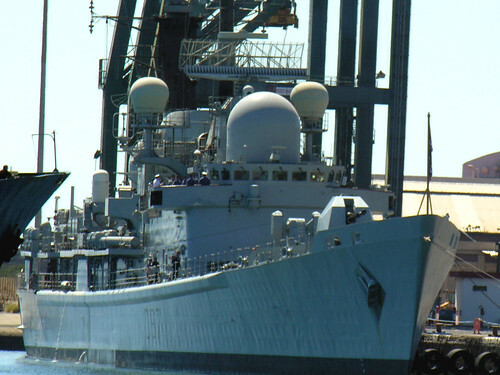 At the moment HMS Edinburgh is on a counter drug trafficking mission off the coast of West Africa before moving on to the Caribbean and the United States. As part of the farewell tour the ship fired the last round of Sea Dart missiles off the coast of Scotland, these too are being replaced, by Sea Vipers. Some of the crew were out jogging just below the ship, I’m not sure what they would have made of the model boats but hopefully they will enjoy their time in Tenerife. Two well worked goals and a solid team performance saw off a young talented Real Madrid C team with a 2-1 win in their own stadium. Prepare to faint – there was even a quality ref who let the game flow. Medina got the nod ahead of Bravo and Abel to replace Yeray, suspended for two games, in the holding midfield role, Llorente returned at left back and Amado kept his place in the centre of defence ahead of Tarantino. 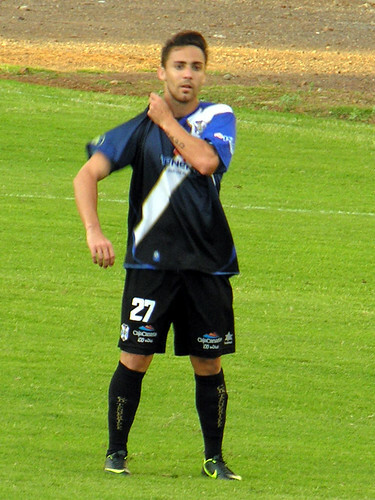 Just three minutes into the match Cristo Martin put in a long deep cross from the left and found Loro who glanced the ball into the net with his head. 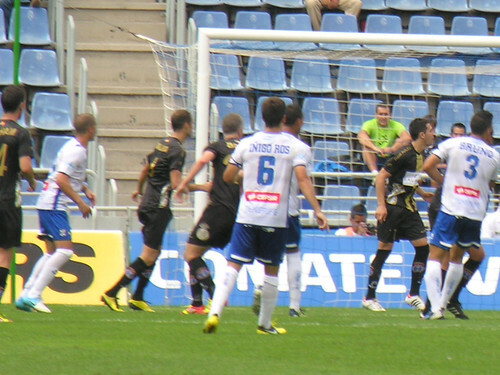 Chechu looked back on form forcing a save from a Moyano (above) ball and hitting a short corner for Aridane to test the keeper after a flick on. Good moves were flowing, Loro found Chechu with a delicate lay off and his floated cross found Aridane to keep the goalie on his toes. Llorente was again making runs up the left but was missing in action after 14 minutes leaving his flank wide open, a low pass eluded Sergio and Ramirez tapped the ball in to level. That stirred Madrid, Ramirez beat the static defence and it needed a touch from Sergio to send the ball for a corner, then Sobrino opened up the CDT back line, thankfully Sergio was on it again. 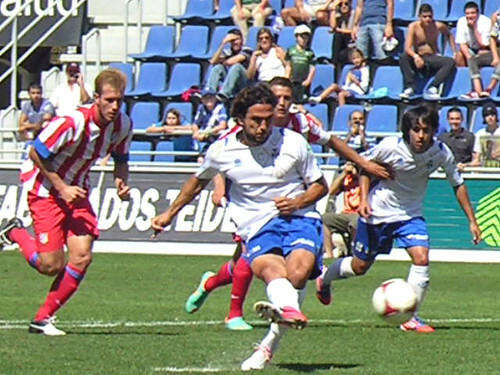 Back came Tenerife, a looping corner from Chechu wasn’t far off target and Amado popped up in the box to go close. Cristo repeated his earlier bomb into the area but this time Aridane couldn’t quite reach it. The second half started well, Loro’s shot was helped over the bar by a deflection, but the winning goal soon arrived. The ball broke to Inigo Ros in space, he took his time to pick out Chechu wide and admired the way his midfield team mate drilled the ball into the bottom corner of the net. There were still a few scares, Madrid flashed the ball across the Tenerife goal mouth and Llorente made two timely defensive interventions. 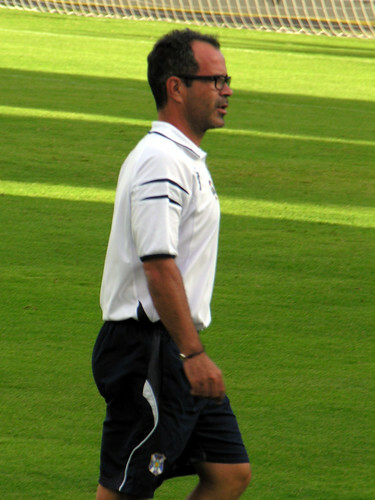 Guillem Marti had already replaced Aridane and Suso swapped passing handshakes with Chechu. The first touch for Suso was to launch a raid and force a corner, Nico made his seasonal debut for Loro and also looked lively. The ref Lixandru , one of the youngest at 32 had been pleasingly invisible and when Ramirez launched himself into the Tenerife penalty box he wasn’t fooled by the dive – wonder who taught him that. Nico and Marti both gave the home goalie some more practice, there was one last scare though in injury time as a home sub fired at Sergio who dropped the ball but recovered to scramble it away one handed. The win was fully deserved and loudly applauded by a good sprinkling of traveling fans. 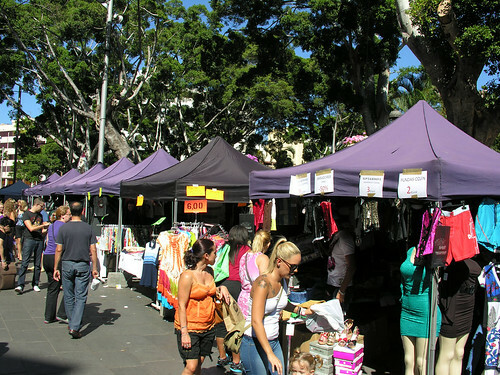 People didn’t go to the shops, the shops came to them, all around the centre of Santa Cruz shopping stalls spilled out onto the street to boost trade. Dancing girls, marching drummers, and live music did the trick and ensured that customers were flowing between zones featuring fashion, electronics, childrens clothes and toys and even art and books. I had a rough plan for what I wanted to see but drifting with the tide in Calle Castillo I was in no particular hurry. Little pots of fruit flavoured Actimel were being offered at every corner by some rather nice promotions girls, I had so many of these healthy drinks I’m now convinced I will live to be 150. I caught some of the early dancers on the main stage in Plaza La Candelaria and then popped along to Plaza del Principe where a carousel of tapas was the big attraction. A dozen stalls were offering a tapa and a drink for 2 euros so of course I sampled a few, it was a lovely setting in the park area with plenty of seating in the shade, families were making the most of the relaxed feel and the wine samples from the stage were eagerly tasted – I tried a few glasses of the red just to balance things up a little after the healthy options. The previous night I attended the Excelencia 2.0 awards in Los Cristianos rewarding good use of social media and in the park I was impressed by a promotion run for Krakis, a new chocolate and nut biscuit with sweet chocolate cream inside mmm. Free bars came with a competition to pose in front of their giant internet screen to post a shot on your facebook page – the queue was massive all day. 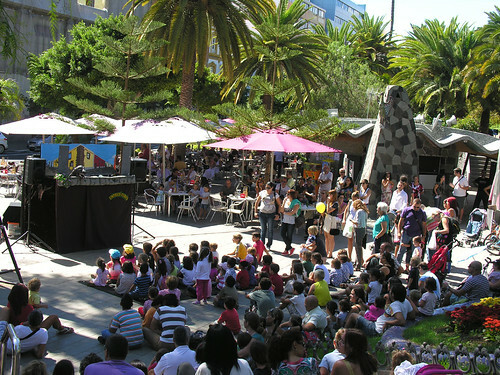 Moving across to Parque Garcia Sanabria a sea of attentive children were enthralled by a puppet show. It was like Punch and Judy but involved a big ferocious looking dog – the teeny audience were made of stern stuff but it petrified me and I was found quivering like a jelly behind a bush. Parents were loving the free entertainment, the open air café was full as the grown ups enjoyed drinks and snacks with their offspring safe and in close view. 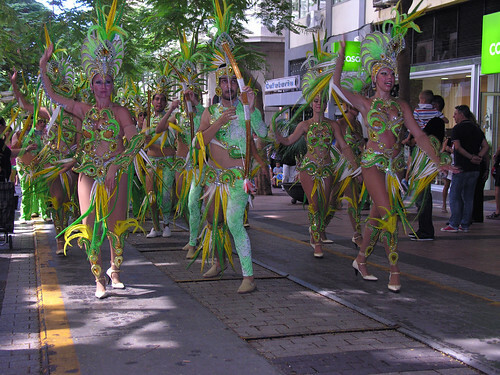 Cutting back through Calle Castillo I stopped to enjoy some street dancers evoking the spirit of Carnaval. 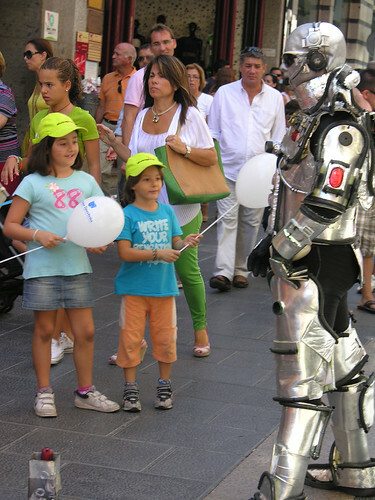 I love living statues and a silver plated Robocop had me chuckling like a drain as he whirred into life to make passers by jump. 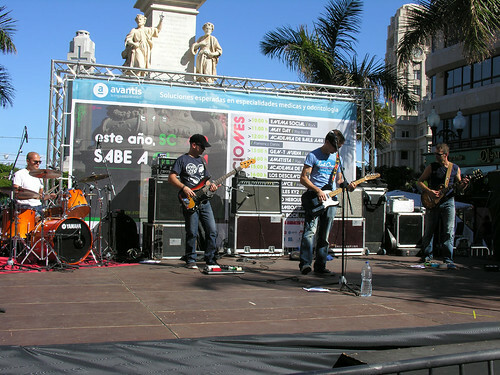 A bit of rock music was on my list of must sees and I arrived back at the big stage just as a latin salsa academy were shaking their bodies. Los Descendientes then took to the stage and I was very impressed, their guitar sound owed a bit to Nirvana and the lead singers snarl reminded me of Alice Cooper at his best. I had a few more calls to make away from Sal 2 but it was still in full swing with a10 pmfinish loosely kept in mind. Hopefully theSanta Cruzbusiness community will have topped up their tills and as for visitors they must have enjoyed the buzz that it brought to the capital city. Rising above Santiago del Teide scorched brown pine trees were a dramatic reminder of the recent fires in Tenerife but nestled alongside them their greener cousins stood proud, nature is already fighting back. 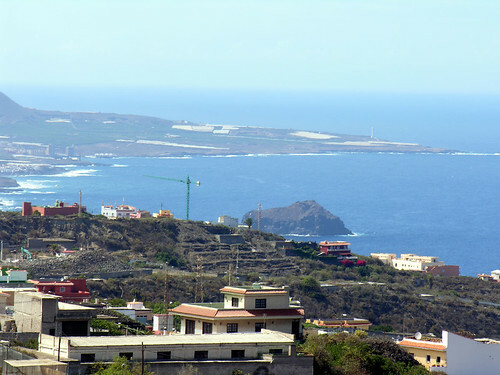 I don’t need much excuse to make the Icod run, the Titsa bus trip from Las Americas bus station is always a favourite, climbing above Adeje the film crews were warming up for another days car wrecking for Fast & Furious 6. For me it was a more sedate pace and good to see clear sunny skies as the bus cruised into Icod. My main mission was to visit the newly opened Hotel San Agustin. 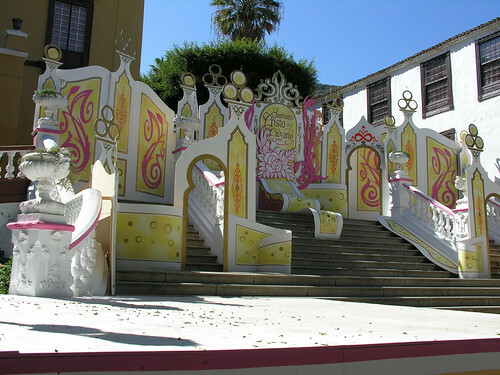 I soon found it in the main street and as the music speakers tempted shoppers with a mix of Swan Lake and Latino dance I put down a mental marker and went for a mooch around. 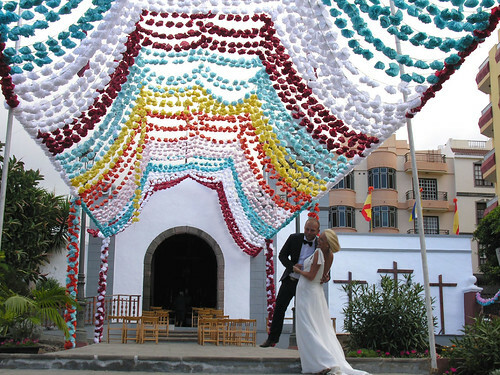 Plaza de Andres de Lorenzo – Caceres was set up for the Fiesta Santismo Cristo del Calvario, coloured bunting formed archways along the main walks and one of the best stage sets I have seen dominated one side of the plaza. Right on schedule a Red Admiral from the Butterfly Park did a mid air display to complete the scene. 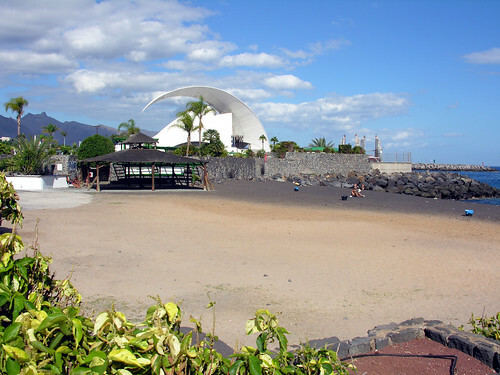 The Hotel turned out to be very impressive, they even had CD Tenerife fixture cards on the reception, but more of that at a later date, next on my list was a bus up to Santa Barbara about 4 kms above Icod to see my friends George and Ingrid at Artlandya the teddy bear and doll museum. 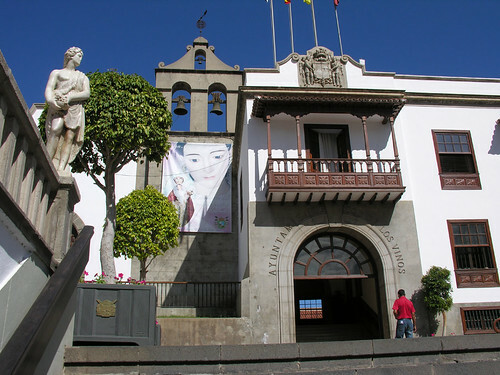 This time I got off at the top of the village to see the two churches but found a surprise in the nearby plaza. 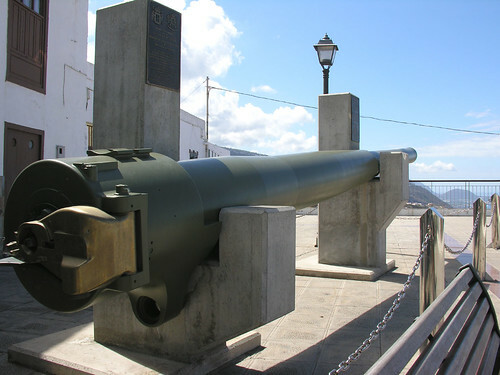 An artillery canon was set up as a monument looking out over the Garachico coast in the distance. Closer inspection showed it was an English design built in Spain by Vickers in 1920, originally carried on the navy ship Galicia it was retired to San Andres just beyond Santa Cruz in 2006. For the technically minded the canon weighs 8,738 kms can shoot to 21,600 metres away and pounds out four shots a minute. Walking down to Artlandya I spent a pleasant few hours tasting home made food and drink with George and Ingrid, their former finca was bursting with flowers as always and the lizards were scuttling across the paths.George gave me a lift back down into Icod and I jumped out at the smaller church on the edge of town to grab a photo of the wonderful fiesta decorations outside. A young couple were posing for wedding shots a few days after their big event, it certainly made a stunning combination. With impeccable timing my bus to the south was waiting for me, another pleasant trip with a stop off at Tejina to have a drink and food with some more friends – a great end to a fun day of new discoveries. 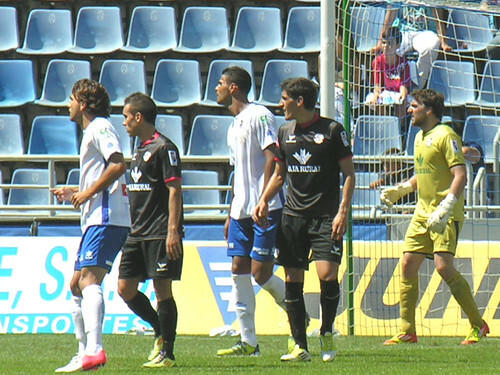 A goal feast was expected but a flat performance left CD Tenerife to come from behind for a 1-1 home draw with lowly Zamora. It was all set up nicely with the visitors carrying the worst defensive record in our section but when did logic mean anything in football. Chechu’s weak tap in front of a welcoming goal in the second minute set the tone for the game. The midfield was not creating chances and although Aridane battled as always, there were too few scraps for him to feed on, his first effort was parried by Sanchez but there was no follow up. 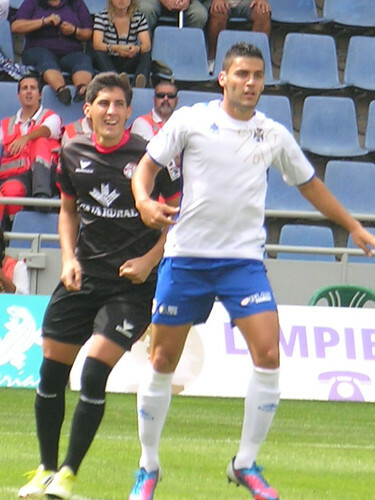 Tenerife had a new look defence, Amado filled in for the injured Tarantino in the centre and Jesus Alvaro slotted in for the suspended Llorente at left back. They had few defensive duties to worry about, Jesus looked comfortable on the ball and went on the attack forcing two defenders to bundle the ball out of play. Sanchez looked vulnerable in the Zamora goal, a one handed flap saved him and a charge out to rob Chechu also came to his rescue. Something bizarre happened on the half hour mark – some light rain crossed the stadium, the locals thought nothing of it but it left us parched southerners bewildered. Loro got into a strong position for a header but put it wide and Aridane was pulled up short for offside when a half chance arose. Cristo Martin did his best to force the pace but twice he got clattered to the ground although the ref kept his whistle dry. Goal less at half time the 8,013 crowd had the nagging thought that Zamora might nick a goal. It only took seven minutes for Santos to do the unthinkable, Sergio Aragoneses saved but couldn’t hold the ball and Santos nipped in and slid the ball under him to grab the lead. Suso came on for Yeray and added some urgency, a nifty cross into the box and Aridane quickly leveled with a header. 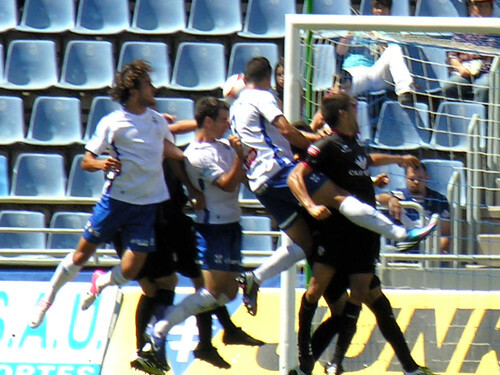 Tenerife pressed forward but Sanchez found his best form in the visitors goal denying Suso with a one handed stop. Jeremy became the latest new boy for CDT when he replaced Cristo and again it provided a brief boost. Loro was unlucky when Sanchez got a hand to his shot, just enough to take the power off it so a defender could hook it clear. Guillem Marti was added to the mix as Chechu went off, he looked nippy but didn’t have the power to force his way through the block defence of Zamora. 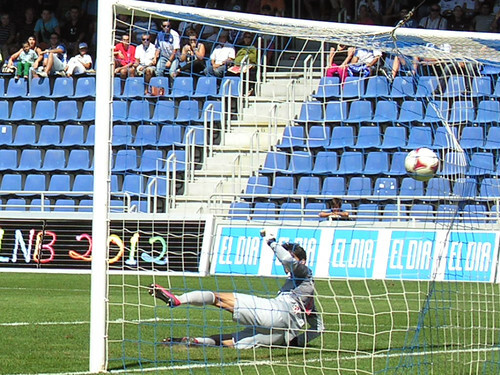 The former Austrian league striker came close but the Zamora keeper just got a foot to the ball to keep it out. Well at least we didn’t get a player sent off the pitch – this week we managed one from the bench. The ref had previously been over to have a word but when he returned he sent Yeray to the dressing room with a straight red – presumably for mouthing off. It was a stupid way to get sent off, the third red in three games and for Yeray a chance to lose his team place after impressing with some fine performances. Zamora had shut up shop and were very happy to settle for an away draw, thankfully the other top teams failed to win so Tenerife stay top but missed a great chance to pull away from their rivals.